Do you love a great one pot meal? I know I do, I love having just one pot to clean up. This is a great meal to use leftover pasta and links of sausage. I don’t know about you, but I am a big fan of one skillet dinners. Going home after work, I am not always inspired to cook up a full meal. I can put together a one skillet meal with great ease. When I first learned to cook I was a massive fan of Hamburger Helper, nowadays I prefer to cook from scratch when I can. This way I can use what I have on hand, season it the way I want, and leave ingredients out that I don’t want. I always have jars of pasta sauce on hand. I find a jar of pasta sauce to be very versatile. You can make spaghetti, a homemade pizza, or use it in a skillet dinner. I love the Italian sausage at Costco. It is lean, well seasoned, and cooks up beautifully. 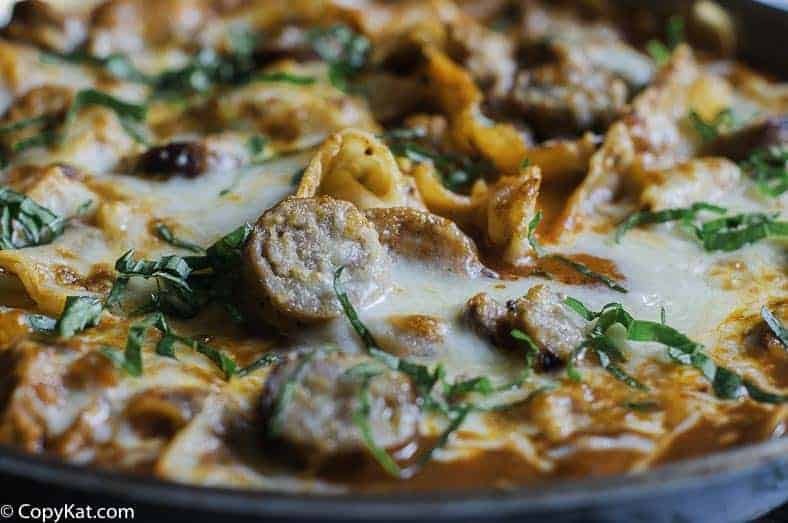 For this recipe, you can cook the Italian sausage in the same skillet the final dish will be prepared in. For this recipe you can use any type of pasta you would like, I have made this with leftover lasagna noodles, or even some other type of pasta. I often keep a container it that has a variety of pasta. So often when I make pasta I have little bits left over and I just toss them into one container. This way I can use them up and I always end up with a dish of pasta that has crazy pieces of pasta in it. Do you love one pot meals? Here are several more one-pot meals you are going to love. 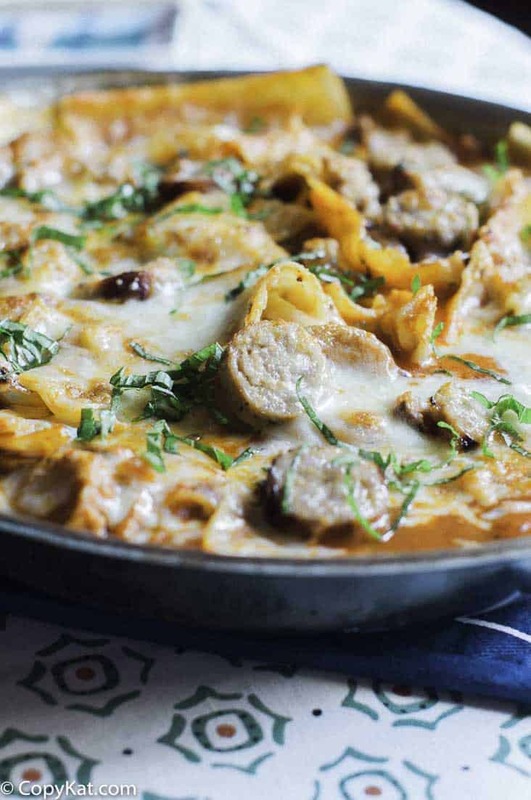 Perfect for a weeknight is this one-pot pasta, this Cheesy Italian Skillet is irresistible. Brown sausage in a skillet unit it is cooked through. Slice sausage into bite-sized pieces. Saute the onions and red bell pepper in the skillet. If your skillet is dry add additional oil add about two teaspoons of olive oil to saute the vegetables. Cook the vegetables until the onions are translucent. Stir in cooked pasta, add pasta sauce and add Italian seasoning blend. Stir in Italian sausage. Top with cheese. If you skillet is oven proof you can pop it under the broiler for a couple of minutes and let the cheese brown. You can garnish the top with chopped basil or chopped parsley. 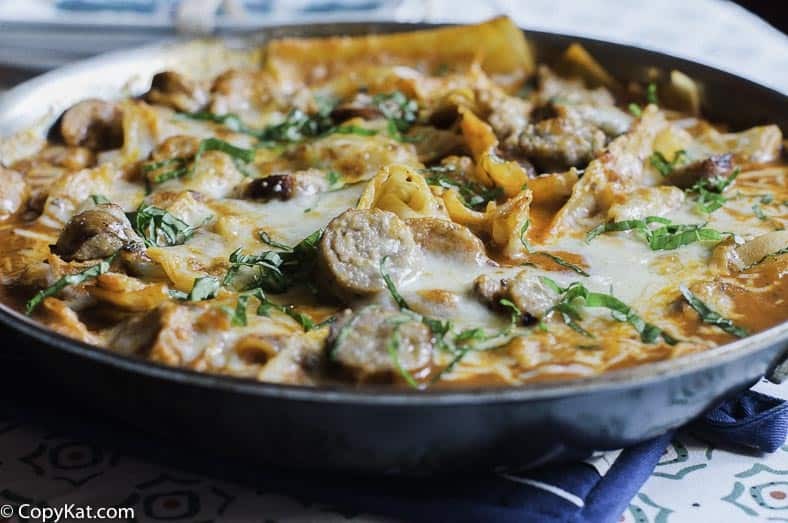 I love pasta and always love to experiment while cooking, I really like this one pot pasta recipe. Not really one pot if I need to cook the pasta in another pot…. Hi do you have a video of this? I do not have a video for this recipe. This looks delicious. I love this pasta recipe. Will try soon!